Backcountry Gourmet Lunch and Fourth of July! I had a wonderful day yesterday catering a backcountry lunch for the Bednar Family. It was one of my first "glamping"-like (aka glamorous camping) experience. My assistant, Monica, and I hiked into a predetermined site, and met them with a beautiful spread of light to moderate portions of lunch for the kids and adults. It was great to get outside, hike, serve great food, and enjoy the spectacular views. Thanks to WSP, Dom at Poppa Presents, and Monica of Jackson Cake Company for letting me have the chance to make things happen! Summer's going way too fast! I cooked 2 dinners in the last 3 days. Have most of the next 3 weeks almost booked solid. The dinner on Monday was for a family that is here for a family reunion. The dinner I did last night was for the Rose Family again, but a smaller group of 10 this time. Cooked dinner for The Rose family...13 adults/5 kids, but only had to worry about the adults. Most everyone was from Dallas. Funtime...especially when the sprinklers came on. lol. The grilling continues! Just got done with the second night...of four...with a group of 14 p.p. (10a/3 kids). Fun, easy, simple menus...great, laid back group. The kids are cool. They also booked me for 5 nights in August! Grilled Beef Tenderloin with a choice of Horseradish Sour Cream, Apricot Chipoltle Mustard, or Raspberry BBQ Sauces. 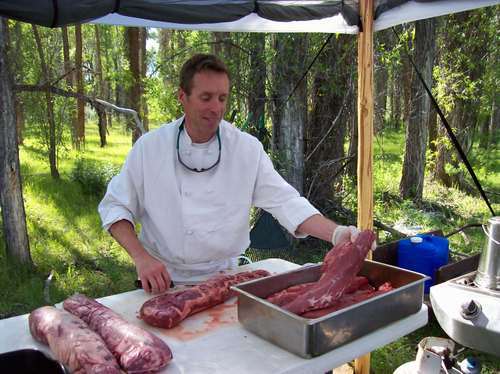 I am honored to be the Grill Master at the Brindisi Wedding that will take place Saturday, June 28th on the Snake River at AJ DeRosa's Tipi Camp. My good friend, Chris Brindisi, and his beautiful bride-to-be, Beth, and their family and friends will be enjoying pot luck, and Grilled Tenderloin. Should be a blast! Welcome to our new webblog! Even though the official summer solstice has not quite arrived, it's starting to really feel like summer around the valley here in Jackson Hole. If you would like to schedule an event with Personal Chef Kevin, please get in touch. Pretty soon we will be very busy.